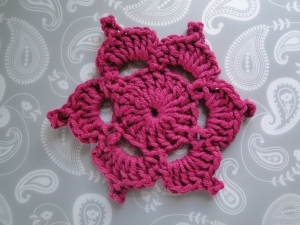 This crochet motif pattern starts off fast, with 17 long stitches worked into a chain stitch to make a circle. 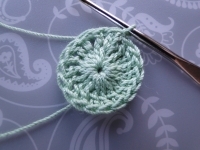 Add your loops in the next round... fill in the loops, popping picots on top - and voilà! 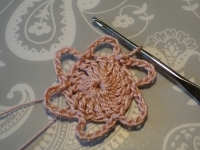 Thread weight cotton yarn, 1.75 mm hook, measures just under 2 inches/4.5 cm picot to picot across. 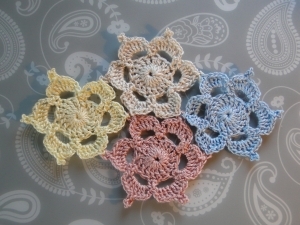 LB Cotton Ease, Aran weight, 5 mm hook, measures around 5 inches/12 cm picot to picot across. 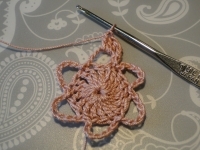 Learn how to join your Picotifs in my step by step tutorial, to create something super special - this is a "join as you go" approach, which misses off some of the picots. 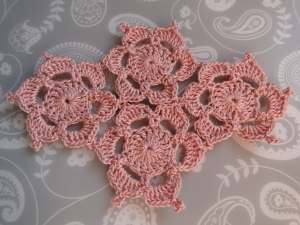 So please check out my method first before making lots of motifs, won't you? I'll give you the written pattern first of all, then a quick photo guide below. 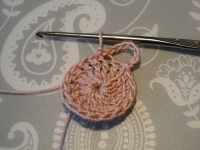 When working your 17 stitches into the 5th chain from hook at the beginning, I insert my hook under the top two loops of that chain as I think it makes for a neater circle. Work stitches under top two loops of that chain. Now we have a neat middle to the circle. 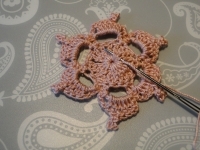 If I only work under one loop of the chain with my 17 stitches, this is the result - whoops! Round 3: (1 sc, ch 2, 3 dc, picot, 3 dc, ch 2, 1 sc) into each 7 chain loop around. Round 3: (1 dc, ch 2, 3 tr, picot, 3 tr, ch 2, 1 dc) into each 7 chain loop around. 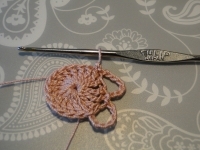 We will meet that joining slip stitch again at the end, when we work into it with a finishing slip stitch! 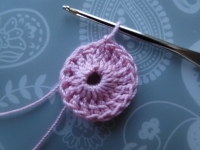 Put a stitch marker into that slip stitch if necessary so that it's easy to spot when you come to that bit. ch 7, skip the stitch you joined into. Now ss into next two stitches. 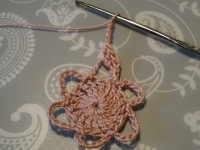 You now have your joining slip stitch in the first stitch, 7 chain, and a slip stitch in each of the next two stitches. 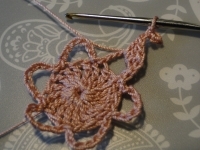 The next four loops are a tiny bit different than the first in that you completely skip a stitch. (ch 7, skip the stitch you have just made a slip stitch into, skip next stitch, ss into each of next two stitches) worked four times. I've worked the first of these loops in the photo. 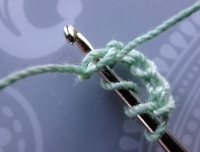 For the last loop, ch 7, skip the stitch you just made a slip stitch into, skip next stitch, ss into the next stitch, then ss into the joining ss you made at the end of round 1. We will meet your first sc (UK dc) at the end of this round when we slip stitch into it. 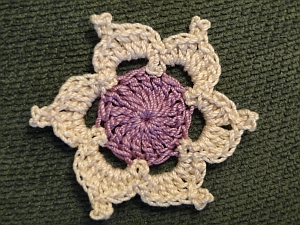 Pop a stitch marker into it now, if you like, so that you can see it later. ss into 5th chain from hook. 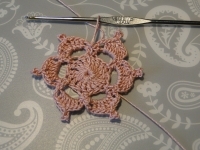 Your picot is ready! US: 1 sc, ch 2, 3 dc, picot, 3 dc, ch 2, 1 sc into each 7 chain loop. UK: 1 dc, ch 2, 3 tr, picot, 3 tr, ch 2, 1 dc into each 7 chain loop. 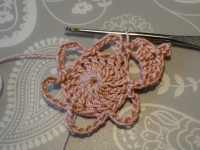 Work a slip stitch into the first sc (UK dc) you made at the beginning of this round. 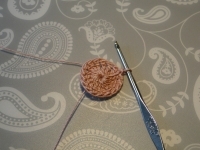 Weave your ends in carefully - I use the circle of stitches on the wrong side of the motif, weaving the ends around the center. 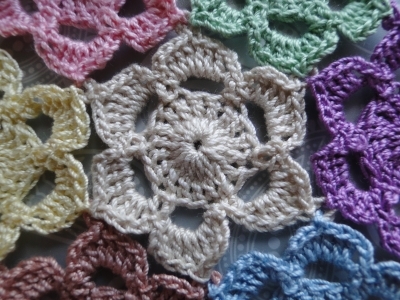 Why not join your Pictotifs to make a coaster, mat, little blanket, cushion cover - or anything else that takes your fancy? 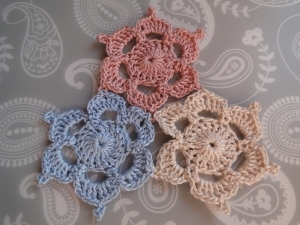 Please don't rush off and make lots of complete motifs before checking out my tutorial! My joining method joins "as you go" - you make only one complete motif, then join on the others as you work. You won't just be sewing them together, you see. 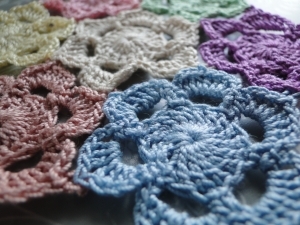 Above: my seven motif mini table mat!